Port Vale defender and former captain Sam Stockley has announced his retirement from football at the age of 32 because of an eye injury. Stockley had surgery to try and correct the problem at the end of last season after complaining of double vision. "This has undoubtedly been the most difficult decision in my career and it's not one that I've taken lightly," said the former Colchester full-back. Stockley started 499 games in a professional career spanning 16 years. He played 12 times for the Valiants this season under new boss Micky Adams and made 37 appearances for the League Two club in all. "My eyesight is something which has been troubling me and, unfortunately, I've had to make the decision not to continue playing," added Stockley, who also enjoyed spells with Barnet, Oxford and Wycombe. "I've only been at Port Vale for a comparatively short time but I've thoroughly enjoyed my time with the club. "I was proud to captain the team last season and the spell I have spent working under Micky Adams has been one of the best periods in my career. Port Vale boss Adams said he was sorry to see Stockley retire. "Sam has been a pleasure to work with and will be missed on the pitch as well as in the changing room," he said. "He is certainly a bubbly character as well as a dedicated professional. "The decision to retire is never an easy one but it was evident that Sam had been struggling with his eyesight and in that situation you have to put your health first. "Sam is an extremely driven character and I'm sure that he will be a huge success in whatever career he decides to pursue." 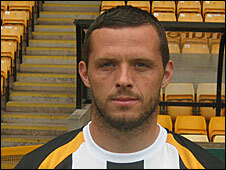 Stockley's short career at Vale Park was full of incident after arriving on a free transfer from Wycombe in June 2008. Then-manager Lee Sinnott installed him as captain for the 2008/09 season but after Vale made a poor start on their return to League Two, Sinnott was sacked just a month into the campaign. The full-back found it difficult to establish himself in the starting line-up under Sinnott's replacement, Dean Glover, and, although he remained club captain, striker Marc Richards became Vale's on-field skipper. Many thought that Stockley had been frozen out by Glover because he would be entitled to a one-year extension to his contract if he played 50 games for the financially-troubled club. But, keen to fight for a place in new boss Adams' plans, Stockley publicly announced that he had changed the details of his contract and that the clause had been removed. Adams named new signing Tommy Fraser as the new club captain but stated that Stockley still had a part to play in his squad. However, Stockley continued to suffer discomfort from his earlier injury and has chosen to quit football on medical advice. He is now hoping to pursue a career in the media, having studied broadcast journalism at Staffordshire University during his time at Vale Park.